Support for MCL/LCL instabilities, hyperextension and general meniscus support. Designed with anti-migration technology to help prevent your brace from slipping. No more stopping to pull up the brace after every step or jump. Stay safer with reflective spots built in so that you are visible in low light conditions: night running, late-nights on the basketball court, or even evening games out in the field. Is the Bionic Knee Brace for me? The Bionic Knee Brace is ideal for athletes looking for MCL and LCL support. It is not an ACL brace. It can also help with hyperextended knee injuries and meniscus support and works well for sports. Still not sure? Try our Brace Advisor for personalized product recommendations to meet your needs! Our DONJOY Performance Bionic knee brace comes from one of the top bracing brands in the world, DONJOY. The Bionic line of bracing offers the highest level of support in our DONJOY Performance line of products. It offers bilateral polycentric hinges to help protect against lateral forces as you run, cut, and jump left and right. The hinges work by absorbing energy and impact as you move so that you can move freely and without restriction. Use the Bionic to help you continue your activities as you are recovering from injury and stay in the game. I am 29 years old and am coming off a torn ACL. The injury happened a year ago, and I am getting back into playing volleyball. I'm wondering if this brace would be best since it seems like it isn't too restraining. Or if I may need something with a little more stability. For measurements, stand with your legs shoulder-width apart, legs slightly bent and leg muscles contracted. Measure up six inches from the center of your knee with a tape measure. Measure the circumference of your thigh at the 6-inch mark. Then measure down six inches from the center of your knee with a tape measure. Then measure the circumference of your calf at the 6-inch mark. Let me know whether I can wear the Bionic Knee Brace under the pants? The DonJoy Performance Bionic Knee Brace is a low profile brace but it does have protective hinges. You can wear the brace under pants as long as the pants have enough leg room to accommodate the brace. I'm a polio patient (1952) have a hyper extended knee due to loss of muscle mass back of lower leg. I need a stop to allow me to put weight on my leg and not have it lock in a hyper extended condition. Brace migration is an issue with loss of muscle condition. I feel I need a moderate to high support brace. Any help on recommending a brace. The DonJoy Performance Bionic Knee Brace has a hard stop built into it to prevent hyperextension, and support knee instability with lateral and medial protection. I've used medium and large knee sleeves for years, and the medium was a better fit. I'm a big guy 6'7" 235 lbs. My knee size is 15" but my calf is 15" and my thigh is 20.5". I've had a meniscectomy from past minor injuries and ongoing wear and tear. I would use this brace for running/jogging and light plyometric and weight training. Is a medium too small or does the sizing run small and a large would be more suitable? 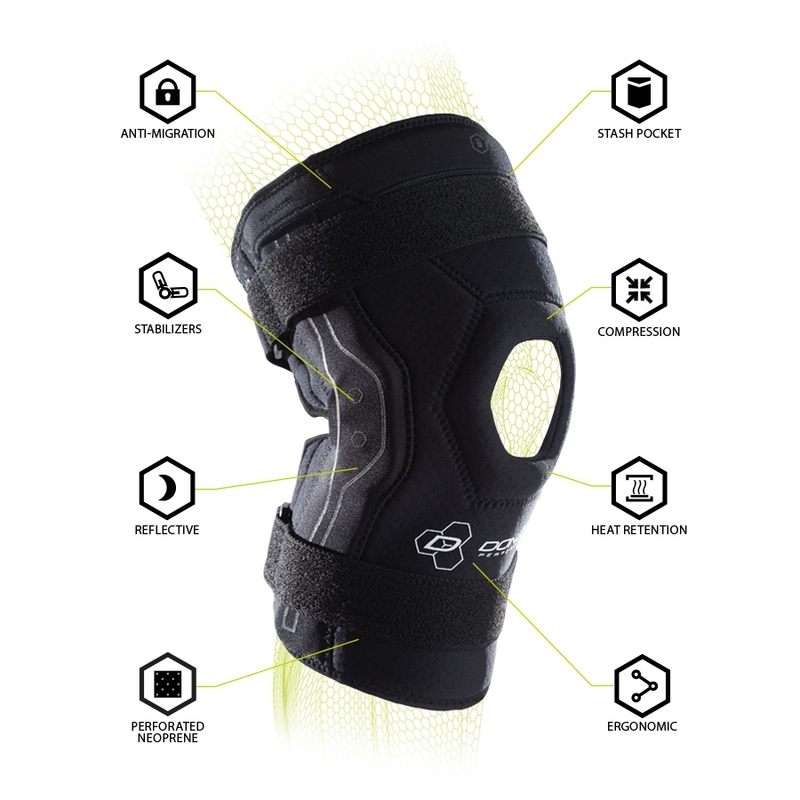 The DojJoy Performance Bionic Knee Brace would be a great brace for your meniscus issue. Its lightweight and low profile enough for running and exercising. Your measurements do fall into the medium range. What is the best way to clean this brace? To clean the brace you can hand wash in cool water with a mild detergent then let it air dry. I have had bilateral ACL/Meniscus repairs done. One in 1999 and one in early 2015. I already have 2 Playmaker and am looking for something smaller, lighter and more comfortable for daily use. I'm also an avid cyclist and was wondering if there is enough flexion in this brace to make cycling comfortable and give me enough movement to make cycling possible. The DonJoyPerformance Bionic Knee Brace will provide both medial and lateral support, and is lighter than the Playmaker, and should still offer the flexion needed for cycling. I am 21. I have injured my knee 4 times. The first time was during football sophomore year of high school. I partially tore my ACL going for a tackle. I did not need surgery. I did rehab for about 6 months. They gave me the brace similar to the Full Force Knee brace. About 9 months later, I hurt myself in Tae Kwon Do doing a jump kick and landed wrong. I went back to the doctor and he said I injured my MCL and LCL. I received rehab for a few months. About 1 year later, I injured my knee playing basketball. I landed wrong once again. I never went to the doctor. I did not received any rehab. I didn't really strengthen it or anything. I'm pretty sure it was just a sprain to my second incident. Then in October I injured my knee playing basketball. I landed wrong going up for a strong layup. I went to the doctor. He said it was just a sprain. He did not give me too much info. It was pretty similar to the second and third incidences, I believe. He gave me one of those cheap ACE sleeves that you can buy at CVS. I have a McDavid knee brace that has the straps but it doesn't have the metal hinges. It is one of those $40 knee braces. Every since my last injury, my knee has been getting stiff occasionally. It sometimes has like a popping cracking feeling when I walk. I feel awkward. I believe it is osteoarthritis according to the symptoms. I really want to get back to playing basketball recreationally at the gym and park. What knee brace should I get? Should I get the webbed one, this Bionic knee brace, or a sleeve like the trizone support or sleeve, or something more heavy duty? My old ACL knee brace doesn't fit anymore. Plus, it felt very bulky when playing basketball or any other sports. I didn't like it because I felt it slowed me down. I want a brace or sleeve that is supportive of my ligaments without it being bulky and slowing me down. Thanks. Can your knee bend all the way when wearing this brace without pain? The Bionic Knee brace has an aluminum hinge that allows for full range of motion, you will not have any problems with going into a deep squat. I have a possible ligament tear (no confirmation MRI yet, so I'm unsure of which ligament) resulting from a weightlifting injury. I jumped too wide in a clean and jerk. My lower leg bowed in lateral to medial. I'm looking for a brace that would be of max support so that I can continue lifting. Is this the right brace? The Bionic Knee Brace will offer general knee support as it has biltaeral hinges. The brace can be worn during activities and should not limit you acitity. I have a torn PCL and am trying to decide between this brace and the DonJoy Economy Hinged Knee brace. My physical activity only consists of short runs/walks and pilates. Do you recommend one over the other? The don Joy Bionic Knee would give you both lateral and medial support and can be used for sports. This brace would be a good choice. Do you think the Bionic Brace will slide around, if I have compression tights on? Is this a pull on sleeve style? Does this brace come in an XS? My son measures for an XS and it is not an option to order. If it doesn't is there another brace you would recommend that comes in an XS? He is 9years old and we are looking for a brace to prevent hyperextension during sports. I am looking for the right brace for my knee. I have pain in the middle of the front of my kneecap. When I hyperextend my knee it pops. Sometimes the pop is painful and sometimes it isn't. I do not feel pain while running or strength training, usually after. Will have pain while trying to balance on one leg. What leg brace/sleeve do you recommend for my symptoms that will be comfortable to train in? As a side note, I also have sciatic nerve issues on the same side as knee pain. My thigh measures 15.5 from mid kneecap. Please advise on size as well as I am on the low end in some braces/sleeves in a small and the high side in an xs. recently tore my meniscus, have an ultra marathon coming up. Doctor said I could run so as long as I could tolerate the pain. Scheduled a scope for later on in the year once school is out. Is the Donjon performance bionic knee brace the best brace to go with? -- I have no prior/other knee/leg issues. I recently had reconstructive meniscus surgery to the outer portion. Two years ago I tore my acl, mcl, pcl and meniscus. I am looking for a brace that will help with running, baseball and basketball. I cannot do another reconstructive surgery!! What brace do you suggest? I am 6'2 and 242 lbs and a very athletic 44 year old man who coaches all three of those sports. Please help!!!! With all of those injuries to the knee, you need a brace that will provide maximum stability and ptoection. The Don Joy Armor with the Standard hinge will provide this for you and protect the knee from re-injury. Question about sizing. I have a athletic build. Knee measure 13 inches, calf is 15in and thigh is 18.5 In looking at the size chart a small won't fit my calf and thigh but a medium will but won't fit my knee cap..suggestion?? I have a torn ACL (not been operated on and it's been 2 years since injuring). Plus I feel a weakening in the opposite knee too. It is unstable and I move with a lot of caution - but I've been able to keep up a level of aerobic fitness without a collapse. I just need confidence on my knees to get into a boxing ring and move around. Can you recommend the best solution at each price point please? The Playmaker II with Fourcepoint hinge will provide you with moderate ACL support and the hinge is designed to train the leg to stay out of the "at risk" position. Sonce your Recopnstruction was a couple of years ago this brace will provide the confidence you need. I have had 2 ACL reconstructions in my left knee along with one bucket tear in my meniscus (totalling in three surgeries). I now have constant pain on the inside of my knee with spuratic bruising and swelling. I have been unable to exercise, other than walk, and am in constant pain. I am looking for a brace to wear on a daily basis to keep my pain level low enough to exercise again comfortably. What brace would you recommend? The Bionic Knee will provide both medial and lateral support to the knee. This will give general support to your knee. I had reconstructive ACL surgery using a patella tendon graft from my own knee in 2010 and in the same knee a bucket handle meniscus tear which required surgery in 2013. Was seen a few weeks for pain and swelling my surgeon said my knee cap is deteriorating and there isn't anything else he can do. I have very little meniscus left and knee replacement is still way down the road. I run long distances (3 miles up to 13.1 miles) Which brace would you recommend? I have very little cartilage left in either knee. Its basically bone on bone. Iam a kindergarten special education teacher and golfer. What brace would help me? The OA Reaction may give you some pain relief if your OA is on one side of your knee. The OA Reaction can unload the painful compartment to try to decrease some of that pain. The webing design will also decrease pain in the front of your kne as well. I had surgery in Sept to reattach my Patellar tendon. So i am 6 months post surgery and 4 1/2 months out of a brace. still have a long way to go to rehab and build strength but I would like start playing golf again in May. Which brace would you recommend for support, both physical and mental! My son is 5'11" and 244pds and is only a 6th grader. He hyperextends his knees a lot. To the point he runs on his tiptoes cause he feels the hyperextending happening. He is too get a brace to help and just want to know if this brace would help or which one u would recommend. He plays basketball baseball and football. Yes the Bionic Knee brace should help his knee by providing general support to the leg. Do you put on the brace standing up, and how tight should all the straps be? standing up, my calf just below my knee measures 16"
my knee center measures 17-1/2"
my thigh, just above my knee measures 18-1/4". Would you suggest this brace for a runner who had ACL, MCL and LCL reconstruction? I'm training for a marathon and my current brace is not doing the job. I saw there is a different brace for just ACL but this one seems more for a runner rather than a contact sport athlete. It depends on when the ACL was reconstructed. If it was more than a year ago then a hinged knee support such ans the Bionic Knee would be sufficient for your knee. Anything less than as year should be a rigid knee brace to protect the still healing graft. For more support and a rigid knee brace the OA Adjuster 3 is a stronger frame and provides support for moderate to severe OA. I had a partial menisectomy. I have a large thigh and whatever size brace I try to get either rolls down and hurts my leg or the size i would need is too large and doesn't support my knee. Can you help me? I've been diagnosed with a small Acl tear in my left knee. I fortunately have no pain, although I sometimes feel a little instability and fatigue after walking for a few hours. Presently, I'm doing a lot of leg strengthening with PT and barre class and just using a compression sleeve to remind me to be cautious. My main concern is with support while golfing and walking distances (like while touring on vacation or using a push cart while golfing). I'm pretty sure the playmaker 2 w force point is the recommended brace, but my preference is to use a one with a shorter sleeve, (Bionic or deluxe hinge?) as my inseam is about 28. Would a shorter sleeve brace provide enough support? tHanks for your advise. Coming off from a moderate MCL sprain and looking to get back into competitive tennis ASAP. Based on description, the Bionic brace seems to be the best choice for rehab and returning to play. My knee measurements are 17.5 thigh, 14.5 kneecap, and 14.5 calf. Would you recommend this brace and what size do you think would be best, the small or the medium? Thanks. Grade 3 year mcl, ACL torn & meniscus tear. Rehabbing knee, mcl healed but loose and knee unstable. Need to strengthen and wondering if this brace will provide enough support for everyday use, weights, running and eventually motorcycling. Your going to need a brace that will offer at least moderate support. The Playmaker II with the FP hinge will provide support for all of the structures that you have injured and should be sufficient for everyday use and light activity. I have had problems with mainly my left knee for 4 years now. I lift weights and when I went down into a squat my knee gave out and I had extreme pain. I saw knee specialist and I had a tiny tear in my meniscus along with my patellar not tracking correctly and overuse. I need a new brace to continue lifting weight and be able to do such things as deep squats. Would this brace allow me to bend all the way and give support? I would suggest the Reaction Web Knee brace https://www.betterbraces.com/donjoy-reaction-knee-brace for support around the kneecap and that meniscus tear you have. The brace is not as thick as the Bionic Knee Brace and you should be able to bend better with the Reaction. I am using a Bionic my right knee when playing basketball for torn meniscus/mcl, and am happy with it. I am tentative with my left knee, however, out of worry of having the same injury I experienced with my right knee, and am thinking of getting a brace to support it. Would it be appropriate to get a bionic, so both have the same support and restrictions, or something lighter like a Performer? Does the bionic brace work for meniscus (posterior and anterior, medial and lateral)? I have one prescribed by my surgeon, but it's awfully uncomfortable. Would this brace be a good option for those with arthritic knees? Will this brace be good for surfing? Pain is on outside of left knee. Dr. can't figure it out. I hyperextednded my left knee when a fork lift pinned me to a wall. The force exerted on my knee tore my medial meniscus. When the surgeon went in to fix the tear, it was already healing, but he noticed that my petallar tendon was damaged. i've been reading up on this brace and it seems to be able to work to help with the stability of my medial meniscus during sports and weightlifting and prevent hyperextension but will it be able to support my tendon as well or will something else work better for that. Honestly, I think I'm more worried about my knee locking/buckling and hypertension during sports activities like martial arts. The Bionic Knee Brace will be proper support for the things you would like to do. The brace provides both medial and lateral support and the hinge should help prevent mild hyper-extension. Another option would be the Playmaker II Knee Brace. this brace is a step up from the Bionic Hinged. The hinge on the Playmaker can be adjusted to prevent more serious hyper-extension. BIONIC KNEE BRACE. Does it come in this size anywhere? I have MS, currently wear a carbon fiber brace for drop foot & have a knee problem from a fall that twisted my knee 20 years ago. Over time my knee has developed hyperextension. Will the bionic knee brace help prevent my knee from locking when I walk. I'm 48 and had ACL repair done in 1996 and I'm just looking for a knee brace that wil let me continue my low impact running and physical training. I just use a sleeve type brace now but need better support. I am 11 months out of surgery to repair my Lateral meniscus. I have been slowly doing more and more strenuous activity and it feels good. I wear a supportive brace similar to this for support but it is not performance based. Would this brace limit the chance of re-injury in high active sport like soccer?? The Bionic Knee Brace would be a good choice to wear for soccer. The brace will provide general support to both medial and lateral sides of the knee and help to prevent any twisting injury. My son is 16 yr old and he had surgery for torn ACL in April 2015. He is Rehabbing it know. The doctor believes we will be close to full recovery by Dec 2015 to wrestle with a required brace. I do not feel comfortable for him to wrestle this soon without support. In addition, weight is a concern, as the state he wrestle requires that any brace used by a competitor most be weighed in with the wrestler. His current brace is 1.6 lbs and requires additional sleeve to wrestle as it has metal bars. Can you advise if this brace will give adequate support and the weight of this brace. Also if you have suggestion of other braces that would be better fit for this use. Hi. What is your recommendation for a knee with no cartridge under my knee cap. My knee also tracks incorrectly. I've had injections and am way to young for a replacement which I don't want and will do everything to avoid. I'm a cyclist and a fitness instructor so I need something that can handle sweat. Thank you!!!!! Which knee brace would you recommend me for a MCL sprain, i got injured approximately 1 month ago and i probably going to start practicing soccer in 2 weeks.. I recently tore my MCL, PCL and my miniscus in my left knee. Dr is going to clean up my miniscus orthoscopically, no major surgery being done and would like to know what knee brace best suits me for daily use. I work outside with normal bending during the day. I tore my acl over 2 years ago. I am looking to get back into play hockey, I am a goalie and would be putting a lot of stress on my knees. Would this brace provide adequate support and still allow enough mobility the goaltending position entails? i had lateral meniscus surgery in March 2015, removing a small flap section. My knee has large amount of arthritis, and during side to side movements (ie basketball) or jumping I have very strong bone on bone pain. Would this brace help reduce/eliminate that? I have a MCL partial tear (sprain). I play the goalie position in soccer so don't think that the playmaker 2 is the option I should go with, I dive and use my knees on the ground a lot. The playmaker was the brace that the doctor gave me. But I don't think his assistant knew what I really needed. Would this brace help me rehab and could I play with it at the soccer goalie position. I also want to prevent re-injury. Either brace is appropriate for your injury and playing soccer. The bionic hinged knee is a shorter brace with a economy hinge. I had an ACL sprain during MMA sparring. I also snowboard and run. Is this a good brace for me? Should I buy lg even tho thigh smaller than lg measurement ? Because of the measurement of the knee center and calf you will have to go with a large size although your thigh measurement is in the small range. I had a torn meniscus a few years ago that healed without surgery. I am training for a marathon now and have soreness on the inside of my knee. Is the bionic knee brace the best bet or will a lighter web brace give the same support? I hurt my knee while playing soccer (i slipped and my body weight kind of slammed onto the knee, i twisted it reflexively and it was hurting after). I went with a friend that is an orthopedic and he said i had a ligament strain. I kept playing soccer and it later became a ligament tear since i didnt take care. I feel pain on the side of the left side of my right knee so I think it's not an ACL tear. Sometimes my knee gives out and I have pain when climbing stairs. What knee brace should I use, would the Bionic Knee Brace be good? I'm about a year and 5 months out from my knee surgery (knee dislocation, torn ligaments and loose bone fragment reattached) and I want to start getting back into lifting. I dislocated my knee about a month ago again and wondering if this is the right brace for me for when I am fully healed or if there is a better option? Thank you! I have bilateral subluxation of the patellae so I'm looking for a good brace, wondering if this would be a good choice or if you would recommend a different one? I would suggest the Tru-Pull Lite knee brace. This brace is specifically for dislocation or subluxation of the patella. The brace is low profile and does still have a hinge for medial lateral support. I have a meniscal tear on the inside of my left knee. I am looking for something I can both wear on an as-needed everyday basis and also for softball. What would you recommend? I have a torn meniscus (in side of knee) I need a brace for swimming. Will this brace be appropriate or which braces will work best for swimming with this injury? I am ordering a M for my son. If it does not fit right, may I exchange it for S? Unused of course. Thank you. BetterBraces.com has a 90 money back return policy, so yes if it doesn't fit it can be returned. I injured/strained my right inner knee while practicing Brazilian Jiu-Jitsu/MMA Sparring. Can you recommend a brace that will protect my knee, yet be light enough that I am still able spar? Please help. Thank you. You will want to have a hinged knee brace to wear to protect the inside of your knee. Either the Bionic Knee or the Economy hinged Knee Brace will be appropriate. My son is 16 and plays high school football (basketball and baseball) he folded his meniscus but that has been fixed - now it just swells when he is playing - what brace would you recommend for additional support and help with swelling during competition? I ruptured my patella tendon in my left knee almost 3 years ago and it's never been the same. I recently began working out again and I'm looking for the right brace for my knee. I do a good amount of cycling, rowing and elliptical work. Would this work for me? The Bionic Knee will provide general knee support because of the bilateral hinges that are on the brace. The front has a padded opening for your kneecap and should provide some support for that area. You might also want to looka at the Webtech Knee Brace. https://www.betterbraces.com/webtech-knee-brace This brace doesn't have the hard hinges but will provide more support for the front of the knee. If you have any pain from that tendonitis this brace will work better at deccreasing that pain while working out. This brace should be fine for someone with a older meniscus repair. It has medial and lateral support and will provide some compression for the swelling as well. My son is very concerned about playing basketball so I was recommended to look at this site for braces and I was wondering if the bionic knee brace would help him this semester from a torn ACL/Meniscus. If your son has a torn ACL then he would need to be wearing a rigid knee brace not a soft one. Either the Custom A22 or the Full Force Ligament knee brace would be appropriate for him. If the ligament has not been repaired, there is not guarentee that he would be able to play basketball even in a brace. I tore my ACL a year ago and had Sugery. I am looking to get into more running and coaching little league soccer. I currently run lightly with no brace but still feel I need some extra support. Would this brace would for that? Hello, I was wondering if the " Bionic Knee Brace" will a great suite for me. I'm a 6'5 210 forward/Center who recently just returned to the court for basketball. However my (Right Knee) has been bothering me. I torn my ACL in the 10th grade and was misdiagnosed and later had surgery 2 years later after the injury in 2011. I've been back hooping since 2012 never really had an issue about my knee besides my quad muscles and leg being weak so I worn a brace while playing here at my college. Unfortunately that problem has crawled back on me. Lately I've been experiencing pain in my Right knee in the lower front on the left bottom side. I also have a little swelling and fluid on the right side of my knee. I also been experiencing pain in the back of my right knee as well. I've been doing a lot of running and jumping and it's my year back. The doctors said my ACL is still intact and so is every other ligament. What do you think is the problem "Would you recommend this brace for me ? I had the patella tendon surgery and I was also told I had some lateral meniscus tears that was fixed. I never had a problem with my knee until now. I'm very athletic I run and jump a lot and that's when the problems and swelling started to occur. Can you please help me pick out the right brace for this season. The Bionic Knee Brace will provide medial and lateral support to the knee as well as compression. This may be all you need since you doctor told you there was no problem with your ACL. I would suggest trying this knee brace when you play basketball. I have very little cartilage left in my knee. I am using your competitors ultra knee support w/bilateral hinges. They work well but their construction is shoddy. Would this be a good replacement? Yes this brace is made with the DJO quality standard, we also have a six month warranty on all of our soft good products. I have had several left knee procedures including an ACL reconstruction. My latest MRI has revealed the ACL has once again ruptured and I have been advised, because of my age (58) and the number of procedures to have a knee replacement. Considering not to opt for the replacement...which brace would be best for everyday use? My son is a high school QB. Fortunately, he has not sustained knee injury. But I would like for him to wear something on his left (throwing) knee but still allow him total mobility. Not sure I'm up for $500 but which of your product(s) should I be considering? My son had acl reconstruction surgery last year. He is playing football this season in the safety position. Will this be a good brace for protection? The DonJoy Performance Bionic Knee Brace is better suited for everyday activity, and wont offer much protection from injury while playing a contact sport like football. For more protection and support the Armor Fourcepoint is suggested, and highly recommended for use during football. I have already had one ACL reconstructive surgery on my L knee and just recently, since I've upped my exercise/HIIT training, I've noticed my R knee beginning to slip, just how the L started. I thought the Performance sleeve would be enough, but a) it's too large (I bought a Small, I"m 13", so not sure why it doesn't fit) & b) offers absolutely no support against hyperextension, which is the direction my knee tends to go. This bionic brace sounds like a better option- I think it even said it has hyperextension stops. I am worried about getting another Small and it fitting too loosely. I understand it velcros in the back for various sizes- just trying to prevent another return for both our sakes. ;) Any suggestions/do you think this is a wise choice for stabilizing my knee during HIIT workouts? Thank you!! The BIONIC KNEE BRACE would be good option which gives you the bilateral hinges to fully stabilize the joint against lateral forces while operating freely doing your training and exercises. It will give you the mild support. There is also the DONJOY DELUXE HINGED KNEE BRACE giving you the moderate support from instability of ligaments, sprains and injuries. Wondering is this a netter option that offers performance for a WR football player, recovering from bone bruising on the Tibial Plateau and knee sprain? i play football and I recently tore my MPFL. Would this be a good brace for me to use? Recovering from back surgery, leaving left leg weak. When attempting to walk, I occasionally suffer from hyperextension, causing discomfort. Will this brace prevent or reduce hyperextension? Yes the DonJoy Performance Bionic Knee Brace will prevent hyper extension. The bilateral hinges will help control your extension to prevent the knee from hyper extending. I am 5 foot 8 inches tall about 260 so I am pretty big for a small statue and really would like the to know if the extra large would be the right fit for me with the Don Joy performance bionic knee brace. 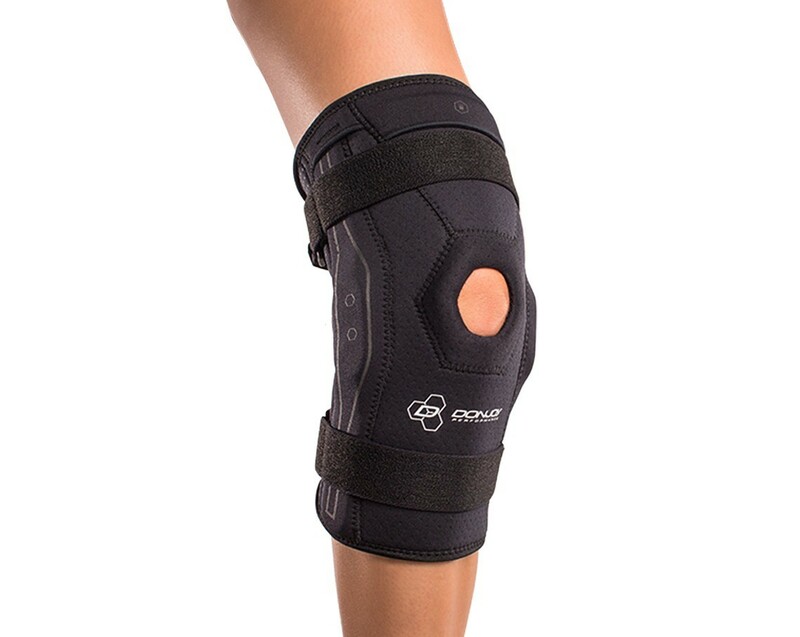 I have a torn acl in my right knee and think about having in fixed in the near future and was wondering why this brace doesnt come in larger sizes for the simple fact I dont know if x large will work for me. Thank you for contacting Better Braces. The measurements are based on the center of the knee circumference so you would have to measure the the center of your knee. The extra large fits a person with a knee circumference of 17 inches to 19 inches. Unfortunately those are the only sizes the DONJOY PERFORMANCE LINE comes. The BIONIC KNEE BRACE gives you mild support compared to the rest of the DONJOY line. The hinges in the DonJoy Performance Bionic Knee Brace are made out of a aircraft grade aluminum. At the center of the hinge it measures approximately 1/2 in thick, at each side. The DonJoy Performance Bionic Knee Brace is perfect for everyday use, as well as use during sports and exercise . The perforated neoprene will help keep you cool and comfortable when your out hiking and being active. Will your replacement part kit work with this brace? I like that this brace is short. For over a year I have been wearing a full length hinged brace for my arthritis and chondomylacia. Would this brace work for those knee issues? Also I have a ful length undersleeve...can I wear it with the short brace or does one come with it? I like your products and your prices are very reasonable! If your on the fence about this brace try it you will like it. Great brace. If I'm awake it's on my knee. Gave it a 4 because of the price. For someone who wears it for activities it is a great value but if you wear it all the time it wears out faster. I have to replace it about every 3 months. This has been a great brace for my knee, but after 3 months of use the lower piping holding the metal bracket in place started to tear. I still use the brace but the metal bracket does slide out when I teach fitness classes. I am a very active person and use this brace multiple times every day. Wish it could last me longer as the price for a replacement is not cheap. Pros: Great support, and easy to put on and take off after use. Cons: Tears at seams if used frequently. Note that DonJoy Performance products have a 6 month guarantee warranty from purchase date. Just contact us at 844-331-7767 and ask for warranty replacement. Worn for Racquetball - Highly recommend! I wear the brace to play racquetball. I previously used models like the ProCare (and the similar DonJoy version). Night and day difference in comfort. Highly recommend this product. Having and using the Defiance111 custom on my R knee, I felt after talking with my Ortho Dr. that the Bionic knee would best suit me for my Left knee. Having no cartilage left in my knee and severe Osteoarthitius, with bone chips and ligament damage. I needed something to be able to keep me working with support. 2 days before receiving my Bionic Brace I was injected with Monovisc. Prior to that and to no relief I was getting cortisone injections frequently as prescribed. The combination of Bionic Brace and injection is amazing. My work activity required a fast paced walk nightly of 11-16 miles in 6hrs. That came to a halt 3 months prior. Now with the combination thankfully I am back up to 9-12 miles a night. I am forever sold on Donjoy for any of my extremity needs if needed, (hopefully not) but will always refer to DonJoy for my ortho stability when needed! I suffer a torn meniscus. After the initial pain and swelling, I was determined to strengthen the leg and muscles around the knee. I ordered this brace through the injury search. It provides the lateral stability I need and want to stay active. I haven't tried running again.. but I bike I do yoga (can't sit on my heels at all, don't know if that will ever come back) I deep squat. Meniscus pain is pretty specific and hard to avoid even with a brace, but this brace provides a nice compression element that process comfort and the stiff side hinges give me the confidence to not be worried about my knee every second. I sprained my MCL in NY right knee. This brace has been great for supporting the knee and guiding it to only move in the correct direction. Pros: Easy to put on/take off. Low profile to fit under skirts and pants. Nice brace. Use it 3 times a week for soccer, more durable than expected. Showing a little wear after 8 months so ordering another. Need it because it braces the outside of my knee enough to keep my medial collateral from hurting with a soccer style kick, the kind of kick that makes the ball travel to the right before hooking left.